Landscape lighting design used to be simple. A few fixtures lining the front path, a couple downlights tucked in the trees, and you were done. Not anymore. When it comes to the great outdoors, homeowners have seen the light. "Today, the biggest excitement in outdoor lighting is the whole artistic aspect," says Dan Blitzer, education consultant for the American Lighting Association. "Think of it as painting a picture of the landscape at night, using lights to achieve the look a homeowner wants." Night-lighting your landscape offers a creative way to showcase your home and property after dark. Properly placed, lights can dramatize trees, highlight favorite shrubs and accent statuary, fountains and flowerbeds. 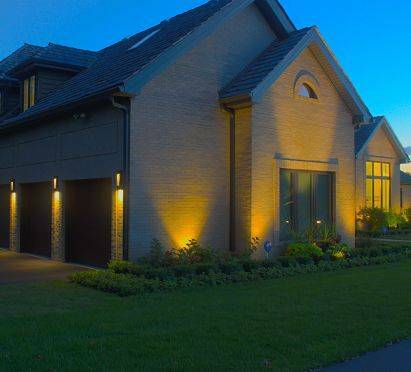 Like any creative work, the Chicago landscape lighting options are endless. "The challenge with landscape lighting is that most people don't immediately see all the possibilities," says Joe Rey-Barreau, American Lighting Association Consulting Director of Education and director of the Lighting and Design Center at the University of Kentucky. 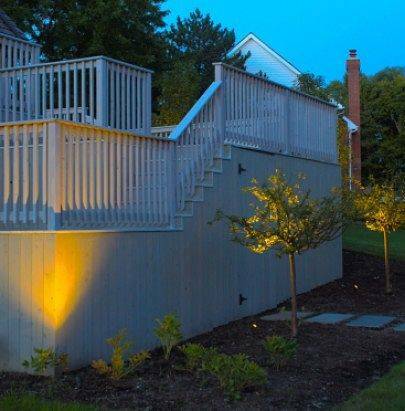 "Outdoor lighting can be both functional and aesthetic. It's an art to understand how much light to place on a house or determine where the focal points are." To light correctly, key in on architectural features. Consider up lighting an arbor, archway or facade for a dramatic effect. Wash the side of the house with a splash of light. Graze a textured fence or wall with a focused beam. Illuminate the water in a pool or pond with submersible lights. Silhouette a tree or bush by placing lights below and behind the object. While some lights take a fashionable approach, others focus on function. Low voltage lights installed under handrails, stairs and bench seating on decks help lighten things up for outdoor entertaining. Stronger beams designed to shine over an outdoor activity area like a basketball court add extra hours of post-dusk fun. A well-lit home is also safer and more secure. Illuminated steps, paths and driveways prevent after-dark accidents. Motion detectors light up obscure spots when someone passes by. Photocells automatically turn on fixtures at dusk and off at dawn, providing protection even when you’re away from home. Styles range from large overhead cylindrical floodlights to minute spot or accent lights used for highlighting specific features. Spread and diffused units set low to the ground, line paths, flowerbeds and driveways and cast a broader glow. The latest looks in such path lights depend on fixtures that can be placed further apart to create a more attractive glow. Some lights are patterned like three-leaf clusters or single leaf containers. Others boast more traditional lantern styles. Still others beam from within floral fixtures installed in flowerbeds. Have an American National Sprinkler & Lighting professional come out and show you how we can add Chicago landscape lighting to your home! Contact us today or call us at (847) 566-0099. We look forward to working with you!